Which commercial juicer is the best? Commercial juicers have traditionally lagged behind home juicers in terms of innovation. But the times are changing, and we've seen a few new models that really reset the playing field. We sometimes hear the question “What is the best commercial juicer?” The answer depends on many factors including how much juice you will make, is the juice being served right away, are you combining ingredients to make juice recipes, is the juicing being done in front of the customer, and more. For example, a bar might only need a small citrus press because they are just making lemon or lime juice to add to cocktails. A mall kiosk might not be able to use a big centrifugal juicer because of the loud noise it makes. 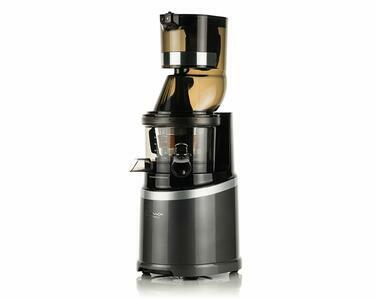 And a juice bar might need several juicers, each focusing on a specific ingredient or recipe. What is the difference between a home and commercial juicer? There is no clear line distinguishing a home juicer from a commercial juicer. In theory a commercial juicer should be constructed of more durable materials, offer a stronger motor with a longer duty cycle, have larger components (like a feeding tube, juicing screen, juicing bowl, and auger) to process produce more quickly, and have larger juice and pulp containers to require emptying less frequently. However, some manufacturers have been known to make minor changes to home juicers (such as replacing a plastic body with stainless steel) and rebranding it as a “commercial” juicer. In addition, in some regions a juicer may require special certification to be used commercially. While all juicers sold in the EU must be CE certified, in the US there are separate ETL and NSF commercial certifications that are required by some county health departments for food service equipment. There are three main types of juicers used in commercial applications: dedicated citrus juicers, high-speed centrifugal juicers, and the new cold-press commercial juicers. Let's take a look at each of these, and list their advantages and disadvantages. Squeezers – These are hand-held tools that look a bit like two ice cream scoops put together. You put half a citrus into in, then squeeze the handles together. It can be time consuming to make a glass of orange juice, but these are great when you need a small amount of lemon or lime juice. Manual presses – Big and heavy, these are simple and solid devices where the cut fruit is placed on a funnel and the user pulls down a handle. The leverage creates a very strong force to get the maximum extraction. The can also be used to make pomegranate juice. Electric citrus juicers – In these juicers, you push the cut citrus onto an auger that spins inside a metal bowl. Some higher-priced models have a handle which presses the fruit against the spinning auger. Centrifugal juicers are the "classic" juicers that are commonly seen in department and discount stores. Rapidly spinning sharp blades shred produce into pulp, which is then spun at high speeds to separate the juice from the pulp. These are by far the most common type of commercial juicer, and are used in most juice bars and restaurants. They process produce at up to 10,000 rpm. They are best suited for places that need to make juice fast, and where the loud machines are away from customers. Also known as slow juicers or masticating juicers, these make juice by gently "chewing" produce into small bits with an auger and pushing it under pressure against a fine screen. They typically operate at between 40-80 rpm. As mentioned before, it all depends on your needs. Citrus juicers are very limited, but make great orange juice. We recommend them for restaurants serving fresh orange juice, hotels which offer a breakfast bar, and bars which use citrus juice as an ingredient. Centrifugal juicers are best suited for high-quantity situations, applications where juice will be used in recipes, or where fresh juice is being served but not prepared in front of the customer. The loud motors make them less suited for smaller cafes and juice bars, although there are some models that have an integrated noise cover. Juice from centrifugals will oxidize quickly, so they should be used or consumed within an hour of juicing, especially apple and pear juice. (Citrus juice will last longer as the ascorbic acid acts as an antioxidant). Cold-press juicers are recommended for fitness centers, juice bars, and cafes – anywhere where the quality of juice is most important. Their relatively quiet motors make them well-suited for businesses where the juice is made in close proximity to the customer. 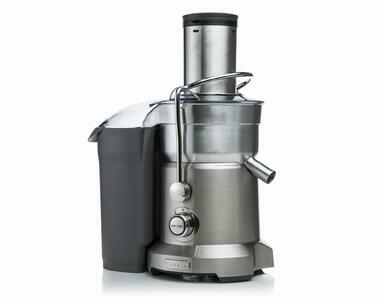 Cold-press juicers are the only juicers that can process leafy greens. Omega C-22 Commercial citrus juicer: A solid (10kg) juicer made of chrome plated metal, it has an 1800 rpm motor and can go through oranges really quickly. 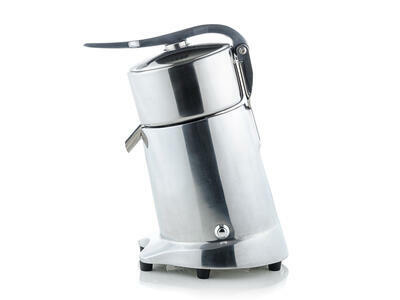 Sana Citrus Press: A manual juicer made from cast iron with a stainless steel juicing bowl, it is simple and reliable. Sage BJE820: The commercial version of the popular Breville Juice Fountain made famous by the documentary Fat, Sick, and Nearly Dead. It is reasonably priced and probably the most popular commercial juicer. Sana Horeca: This unique juicer takes the vertical single-auger design made popular with home juicers, and beefs up the specs for commercial use. It has a wide mouth for less prep and a commercial motor rated for 24-hours continuous use. Maybe the best feature is that it includes two complete juicing head assemblies, which can be quickly interchanged for different recipes. Santos N65: A massive 30-kg vertical juicer made from cast aluminum and stainless steel, it uses a variable speed industrial motor (5-80 rpm) and can make cold-pressed juice nearly as fast as a centrifugal juicer, but without the foam. Very expensive, but probably the best commercial juicer on the market.